Welcome to the Gifts2Manila website. You're probably here because you want to know a bit more about us. Well, our story may not be that long but we'll surely tell you what we strive for. Our vision is a world with no barriers where anyone can reach out to their loved ones not only in communication channels like the Internet or mobile phones but also in a physical sense through gifts. Our mission is to deliver nothing less than fresh flowers and food items along with other gifts in extremely good condition. We also strive to deliver everything on time and at the lowest price possible. The concept of Gifts2Manila started when its owner realized how much people need to pay for when they are ordering online. While online deliveries are certainly more convenient as it does not force the client to visit the physical store in order to make a transaction, it is still quite pricey. With this, Gifts2Manila has started its website where it essentially provides the same service but at a fraction of the cost. With this, they hope to attract all Filipinos who have always been so fond of "sulit" and "libre". Gifts2Manila is the only online gift delivery website out there that understands the uniqueness of the Filipinos who love getting the best value for their money with every purchase they do. From here, you are probably wondering why you should choose Gifts2Manila. After all, there are already other websites that provide the same service. Well, the company is not ashamed to say that its services are better than the rest. And it is with 3 good reasons. First of all, Gifts2Manila is not a new player in the industry. As a matter of fact, it is a company that has been serving their customers from 2008. With over 5 years in the industry, the company can proudly say that it already knows what it is doing. Having encountered over a million orders throughout its lifetime along with thousands of customer concerns, the company is well adept in handling just about any type of problem in the industry. You'll also like it because of its professional and personalized services. If you have tried ordering from other online websites, one of the things that you will observe is the lack of consistency. First is the failure to deliver the item that has been displayed on the picture or at least provide an item that will resemble it. Another is the poor customer service. For Gifts2Manila, this is not really a problem as they are more focused on satisfying their customers more than anything else. Last but definitely not the least; you'll like Gifts2Manila because of its relatively low prices. In fact, the company dares you to look at the prices of items in other companies and compare it. 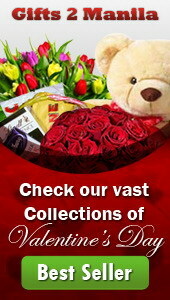 One of the things that you'll find out is that the flowers in Gifts2Manila are at a significantly lower price. But more than appealing to the Filipino's need to extend their peso, Gifts2Manila's goal is to provide quality services at a fraction of the price. This in itself is a service that is sure to blow customers out of the window. These reasons may look simple but they are the reasons why Gifts2Manila continues to be one of the top online delivery websites in the Philippines. If you have been ordering online for years, now is the time for a drastic shift. Now is the time to order from Gifts2Manila.